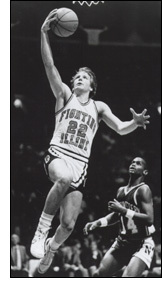 Doug Altenberger is a former Richwoods star who went on to a brilliant career at the University of Illinois. He set a single game scoring mark among Peoria schools in 1982 against Pekin when he scored 55 points for the Knights, topping the old mark of 49 set by another Richwoods standout, Mark Smith. At one time he held the University of Illinois' record for three-point accuracy with a .474 percentage and currently is No. 15 in all-time Illini scoring at 1,271 points. He was also No.8 in steals with 133 and ninth in assists. He was named the IIlini's most valuable player during his junior year in the 1984-85 season and was a third team all-Big Ten selection in his senior year. A four-year starter, the Illini averaged 25 wins during his career. Illinois coach Lou Henson on Altenberger, "Doug truly exemplified the total package student-athlete. He had the unique talent to inspire his teammates to reach for the next level. He issued challenges and they responded. The intense personal effort that he exerted made him one of the most hard-nosed defensive stoppers I've ever coached. His offensive skills are legendary, a three-point shooter before the inclusion of the three-point shot. "Doug proved to be one of the most popular and well-respected athletes among the student body, his own teammates and IIlini fans. I consider Doug one of the finest young men I've ever coached."